Amazon has just recently updated its Kindle application for iOS, adding the ability to read magazines on the iPad and other small features. 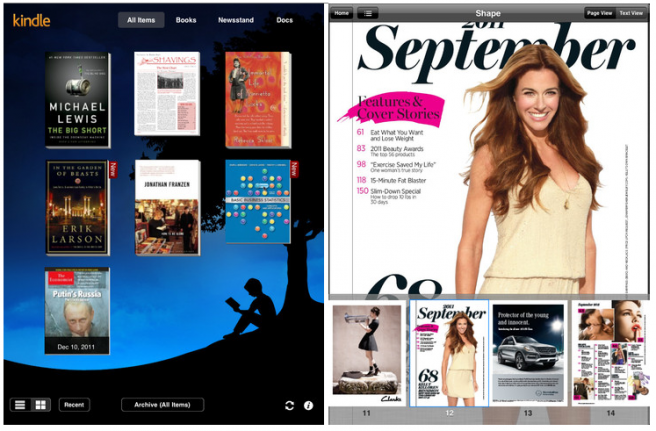 – New Design for Magazines: Kindle for iPad customers now have access to the huge selection of over 400 magazines and newspapers that are available on Kindle Fire. Magazines such as Martha Stewart Living, Food Network Magazine, Cosmopolitan, Men’s Health, Popular Science and many more are displayed in rich full-color pages. Customers can buy a single issue or subscribe to popular magazines and leading newspapers and have them wirelessly delivered to the Kindle for iPad app. – Read print replica textbooks including rich formatting and layout of the print editions and support for notes and highlights, zoom and pan, and linked table of contents. Also, Amazon has added support for Send-to-Kindle on all iOS devices, thus allowing users to send documents to their Kindle devices and also having the option to store them in the cloud. Lastly, a new built-in PDF reader also allows users to open and read PDF files within the Kindle application.